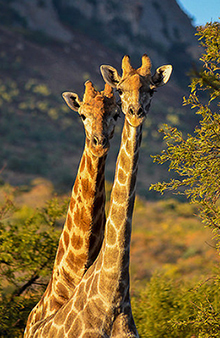 The giraffe symbolizes communicating in the empathic spirit of NVC. Nonviolent Communication (NVC), developed by Marshall B. Rosenberg Ph.D. (1934-2015), is a process used for transformative connection, based on the philosophy of nonviolence and an empathy-focused language for its expression. Fundamental to NVC is nurturing the natural state of compassion, where the heart desires no harm, and the recognition that all people share the same basic human needs. NVC points out that everything we do and each action we choose is in service of needs, and an attempt to serve life. Conflict arises not from the needs themselves, but from the strategies used in attempting to meet those needs. Strategies that put one person’s needs above another one’s needs, or some needs above other needs, are very costly to our relationships, yet these are the typical strategies we have learned and the only ones we know. NVC offers a path to finding new strategies that are needs-inclusive and less costly; a path to authentic communication, reconciliation, listening and being heard, deeper connection, and harmonious interdependent relationships that support mutual well-being. NVC practice deepens our understanding of how we think, what we observe outside and in ourselves, what we feel and why we feel what we feel, the underlying needs and values, and what choices we have. Our habitual methods of blame, threat and force shift to more powerful, sustainable and mutually beneficial strategies of communication. NVC has been successfully used world wide to build peaceful and respectful family relationships, to resolve conflicts in communities, schools, businesses, and prisons, to achieve win-win policies in government, and to shape nonviolent strategies in social change movements. Nevada County NVC promotes regional Nonviolent Communication trainings, activities and resources, striving to make NVC teaching, facilitation and practice available to everyone.